The software in the gb_common.c file now checks the hardware and selects the peripheral addresses depending if it is running on a Pi-1, 2 or 3. I am between houses and with 99% of my possessions in boxes I have limited capabilities of testing. If anybody finds bugs (or find it works) please tell me using or the Pi website here.. 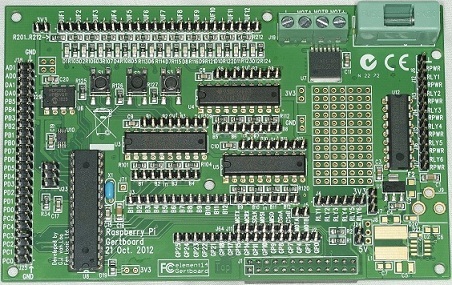 The Gertboard (classic) is one of the first expansion boards for the Raspberry-Pi. It comes with an extensive manual which will lead you step-by-step through the difficulties of working with inputs and outputs: Gertboard manual. Hans-Dieter Busch has translated the document in German and has made that available to me: Gertboard Benutzerhandbuch. The code used in the manuals is also available. The C-code: Gertboard code (C) .zip and the Python code: Gertboard code (Python) .zip. For instructions how to unpack the archives look here. 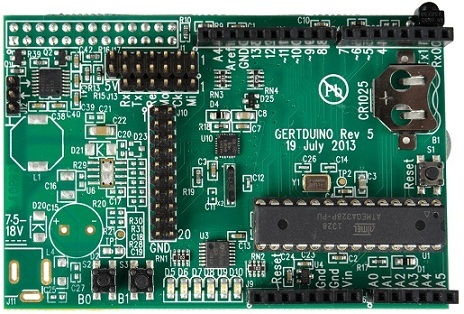 There is a forum for the Gertboard on the Raspberry-Pi website: here.